I guess you could drive it into midtown, if you really like getting stressed out. Crosstown traffic is a drag in a car, I can’t imagine trying it in an RV, getting stuck in an intersection, and having every cabbie on the west side leaning on their horn. I did see an RV parked in the traffic circle in Central Park, but I doubt they were in for the weekend, it was probably a photo shoot or something. 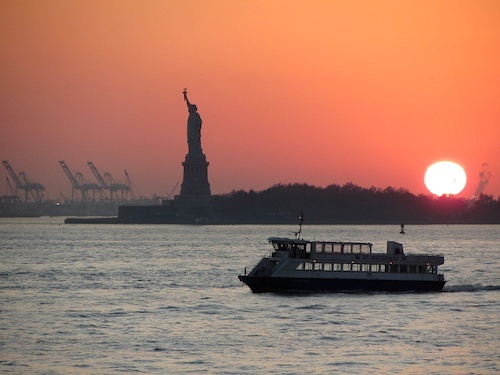 If you are traveling in an RV and you want to see New York City you have to go to New Jersey. Your only option is Liberty Harbor RV. It’s small (only 50 sites) and expensive as far as RV parks go ($70-80 an night.) But you have the PATH train into downtown right there, as well as the commuter ferry to Wall Street, and I understand there are tours that leave right from the park. Your are not going to get a hotel room in Manhattan for that price, so I don’t think it’s a bad deal. 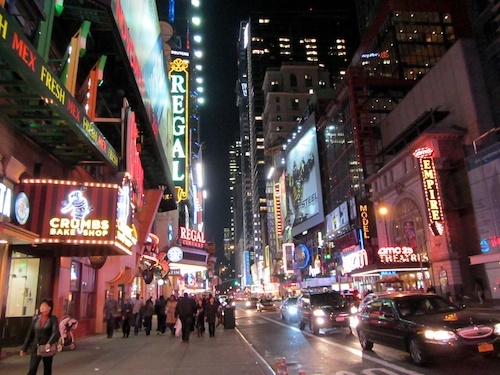 In my humble opinion New York City should be on everyone’s bucket list. I may be prejudiced, I went to school there, I worked there, and even though I am wandering the back roads and no longer in New York, I try and go back every year. I have to confess, we don’t take the RV, in fact Hubby hates all things about big cities. He sends me off to stay with some college friends and everybody is happy. So what do you do with a few days in New York? That is a difficult question to answer since the Big Apple has so much to offer. I love the museums, Central Park, the theater, the excitment of midtown, but if you head downtown, there’s also lots to see there as well. 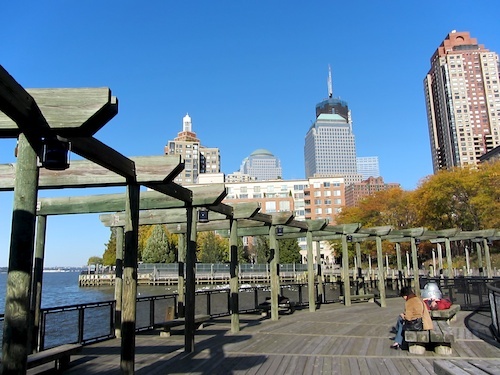 …and stop in the World Financial Center. 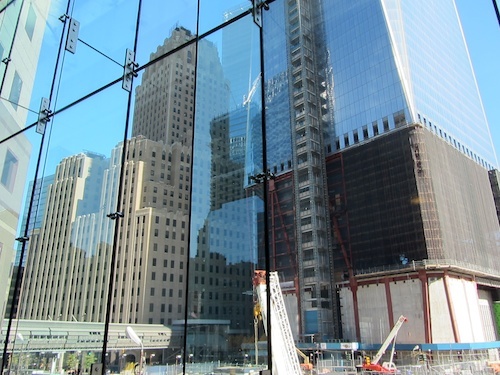 It has a beautiful atrium and you can look out at the new World Trade Center construction and the 9/11 Memorial. 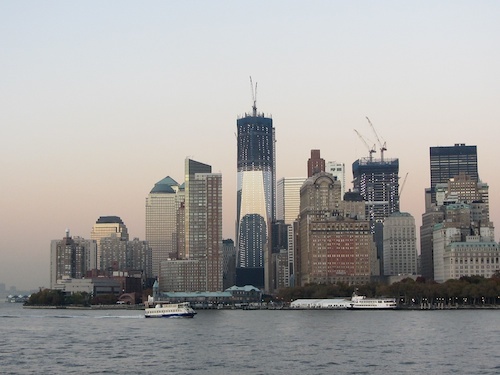 I used to work in that building on the left, well before 9/11, so it’s like going back to the old neighborhood. Except the old neighborhood will never be the same. I don’t know about you, but I’m tired. It’s been a long day. We’ll save Brooklyn and the Bronx until tomorrow. Never had really given much thought to NYC by RV. I’ll tuck this info away for future reference. Thanks. Lovely pictures and this post comes at just the right time! I’ll keep all your suggestions for future reference should I end up at school here. 🙂 Thanks for sharing! Hmmm!Hmmm! Not being a city person either NYC just does not have the appeal it might once have had in another time and place. RV park fees at $80 per night is not a bad deal. I can tell you about places in Australia, nowhere near a capital city and fees are up to $70 per night. As you know we avoid RV parks and prefer Freedom Camping. When we do go to parks we are looking for the best price available…Under $20. 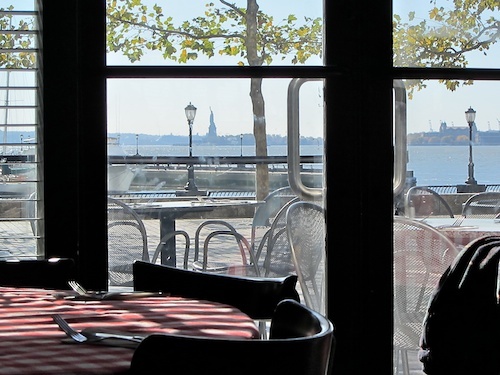 Enjoyed your post about being in NYC – my hometown. Loved your photos too! Thank you, I went to college and grad school there and worked there most of my career. I love it and go back at least once a year for my annual fix.